My name is Jason, and along with my business partner Traci we represent the sole employees of Girls of The Con. Between the two of us we’ve organized, designed, scheduled, photographed, and promoted cosplay culture for over a decade through GOTC. Click to Visit our GOFUNDME Campaign. Click to Visit our Facebook. Click to Visit our Instagram. Over 10 years ago we started this project as a way to showcase the amazing talent and skill of the many costumers and cosplayers that inhabited the sci-fi and fantasy convention circuit. Since that time we’ve produced 7 full length cosplay calendars. Worked with 100’s of models. Attended and showcased hundreds of conventions and thousands upon thousands of cosplayers of every level. No matter gender, age, weight, race, or skill level we’ve cultivated equality in our work and like the convention culture that birthed our inspiration to start this all, a sense of family and belonging. Our work has been featured in the likes of Marie Claire, Cosplayzine, Cosplay World, Grease Magazine and more simply by investing our own time, perseverance, and the help of fabulous participants that has helped push us forward along the way. We need your help to bring this entire crazy decade together in one beautiful collection . We are here to offer our fans and supporters something we’ve never done. A memento of 10 years hard work come to fruition. This book will be a culmination of a 10 year labor of love. Highlights and delights from past calendars, conventions, special events, and more! Con Culture, Costuming, Cosplay come to life on the pages as Flesh Meets Fantasy and you step into our world and have a look around. 200 full color glossy pages bound in a heavy softcover frame. A decade long compendium celebrating this culture that has captivated us so. We hope to bring 5 to 10 new cosplayers into our fold as well for all new photoshoots which will be exclusively a part of this book release. We will be showcasing each cosplayer as they sign on for this project with updates here throughout the length of our pre-sale. We have already begun the process of taking submissions and selecting our new cosplayers for this book project. In order to make this book a reality we need to pre-sell 250 copies. We are attempting to raise $7500 for the first run of 250 books ($30 each). We are accounting for the cost of the books to be printed in mass. The cost of shipping the books to us. The cost of shipping the books to you. And the 3% that that we will lose to process the transaction. There is ZERO PROFIT in this for us .In fact we will be out of pocket for many of the costs involved in the production and travel required to complete it. We just want to share our work and highlight a decade of dedication to Cosplay and the many artists, models, designers, prop makers, stylists, and craftspeople who represent its many forms. Our goal is to finish layout of the book and place the order by late March of 2019 Which means we’ll need to have met our pre-sale goal by March of 2019 to stay on schedule. The book will be debuted officially at a large popular Atlanta based convention and available for pickup or shipping ideally around September 1st, 2019. And that’s where you come in. Familiarize yourself with our work and if you see fit, please help support our effort to bring this decade long project to fruition. Buy one for the cosplayer in your life or just as an interesting piece for your collection. A rare compilation with only 250 copies in the world! Please consider helping us bring it to life by picking up a copy today. Pre-purchase a copy and help us reach our goal of 250 units sold so we can place our first run print order. Signed Limited edition art book 10 years in the making for $30?? Deal of the century! Help us bring this dream to life. Pre-Order and get a copy of the book shipped to you inside the United States – (no International shipping). 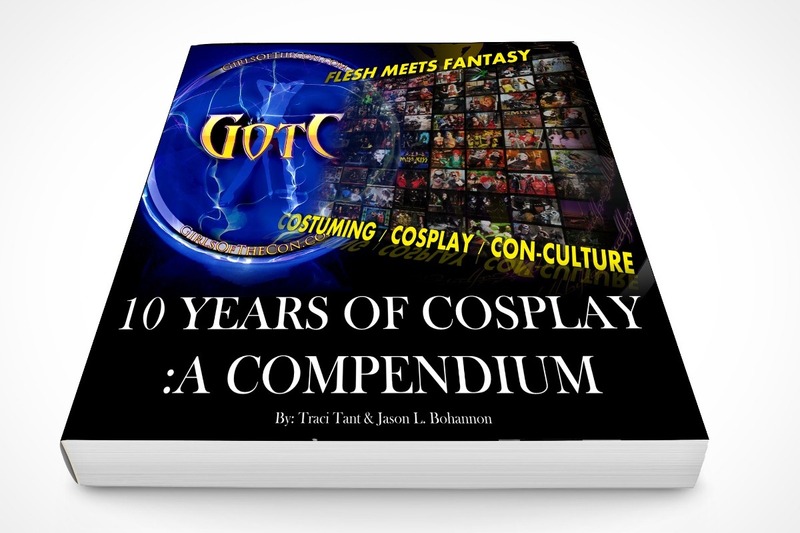 Also get your name on the “Supporters of the cosplay arts” page inside the book itself.